What did Hannah pray for? What did Eli the priest tell Hannah? What did Hannah and her husband name the baby? Make a loop and then a hoop! Six! 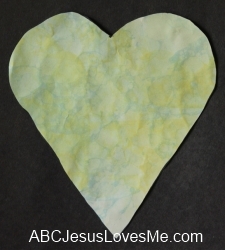 - Color with colored pencils and cut out the Hannah Prays and Hannah and Baby Samuel worksheets. Place on craft sticks and use to retell the story. 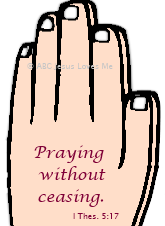 - Praying Hands - Trace around each of the child's hands with fingers together. Cut out and glue together. Write the Bible verse on one side. 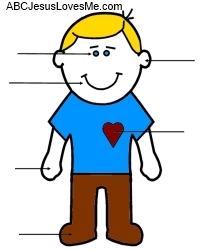 Using the "I Can Serve God with My Body" Boy or Girl poster have the child identify the body parts. Explain that the Bible story this week is about a very special lady named Hannah. She loved God with all of her heart; she used her mouth and hands to pray to God; she used her feet to go back and forth from church; she used her ears to listen to God. Then ask the child, "How can you use your ____ to honor or do things for God?" Fill in each line with the child's response. To finish allow the child to color the page. When I'm feeling sad and blue, I'll pray! I'll pray! When I don't know what to do, I'll pray! I'll pray! God is with me every day. God is listening when I pray. So, I'll talk to God every day, I'll pray! - Introduce the letters Ii using the tactile letters and decorate the Letter Poster to add to the Letter of the Week book. Place the numbers 0-6 into a bag or basket. Have you child draw out one and tell the name. Using tactile letters, have your child trace over letters with her finger. Say the Letter Formation Chant as you trace each letter. - In the illustration of the mother bunny rocking the baby bunny, point out the picture of the cow jumping over the moon. Review Hey Diddle, Diddle from Week 7. 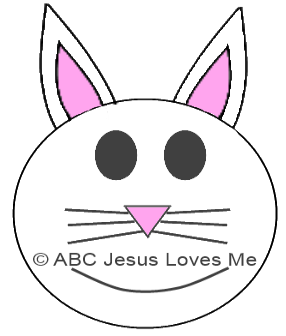 - Create a Paper Plate Bunny by gluing construction paper ears to the top of the paper plate. Add two eyes, mouth, nose, and whiskers. 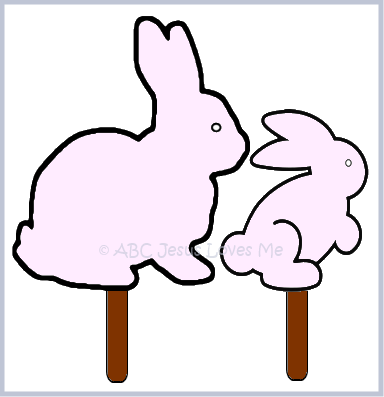 - Cut out the Never Run Bunnies worksheet and back with cardstock. Glue cotton balls on the bunnies’ tails. Glue to a large craft stick or a ruler. Play hide and seek allowing the little bunny to hide. Use this opportunity to explain that we can never run away from God or His love. Using shallow cups , write a number (0-6) on each cup. Have the child fill each cup with the correct number of small items: chocolate chips, buttons, coins, etc. Make sure that your child picks up the small items with their thumb and index finger. For fun, time the activity. Ribbon Dancing - Attach ribbons, streamers, or scarves to the end of a ruler, dowel, paper towel holder, or straw. Hold the ribbon swirling it from side to side, up and down, etc. Be sure to switch hands. This activity improves hand-eye coordination.